You’re right though, it’s definitely a classic. Phew! I was getting alarmed when you said you’d never heard of the song. I feel like everyone who was alive in the ’90s has picked up at least some of it! Mr. Jones came out in 1993?! Whoa, I was still in primary school then! I only heard this song when I was in high school, I didn’t realized it came out earlier than that. I feel old! LOL! 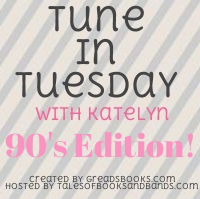 Well, honestly, this 90’s edition of Tune In Tuesday is making me feel old, but it’s so fun to remember all these songs! I love 90’s music! I KNOW! I’m feeling super old too, but it’s fun to hear all these songs that remind me of my childhood!